Directional Permeability Modeling - Geomodeling Technology Corp.
SBED™ directional permeability technology models the small-scale sedimentary details that impact large scale reservoir performance. 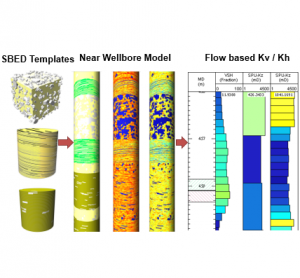 Unlike conventional reservoir-scale modeling software, SBED utilizes geological processes from upscale core plug measurements to full field models. SBED models address reservoir heterogeneity observed at both core and outcrop scale. Represent the internal heterogeneity of channel infill deposits in the reservoir model. Perform high-resolution facies modelling, then flow-based upscaling to estimate facies dependent Kv/Kh. Determine realistic relative permeability curves to improve the accuracy of production history matches and reserve estimates. Multi-phase upscaling workflow for each facies in the production simulation grid. The most innovative system on the market, AttributeStudio, offers an integrated interpretation and analysis platform. Read our case studies to see how AttributeStudio can work for your organization. Get Product Information, Schedule a Demonstration, Discuss Project Solutions or Contact Support..